Gewa has been known for cases for over a hundred years. Idea, Air, Jaeger, and Strato models made in Germany. Other models made in China. One year warranty. 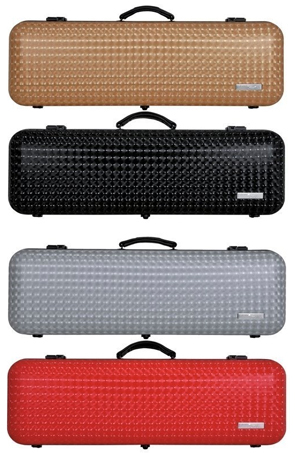 Oblong suspension case with carbon fiber reinforced synthetic resin shell. 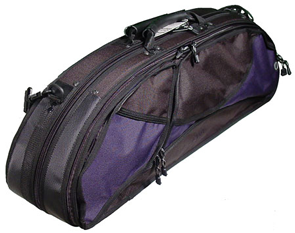 Removable accessory pocket, four bowholders, shoulder rest straps. Velour interior. Weight is approximately 5 lbs. 4/4 only. 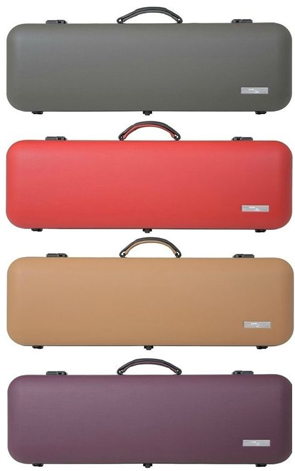 Oblong suspension case. Shell constructed of 80% Hi-Tech carbon fiber fabric. 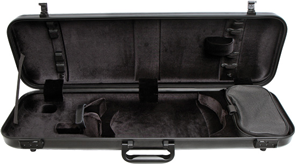 Removable accessory pocket, four bowholders, shoulder rest straps. 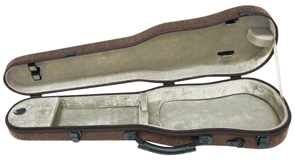 Removable exterior music pocket. Same interior as Idea 2.3. Weight 4.4 lbs. 4/4 only. Suspension interior. 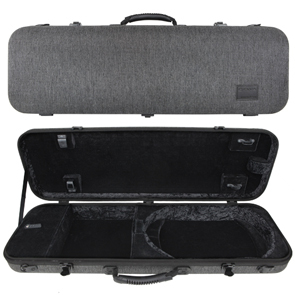 These new German-made cases from Gewa feature a specially developed energy-absorbing thermoplastic shell that is extremely strong, yet lightweight! 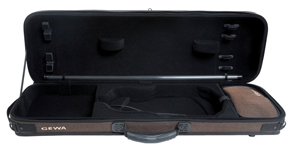 Gewa AIR cases are produced by bonding the material with heat. The foam between the inner and outer shells is injected under high pressure. 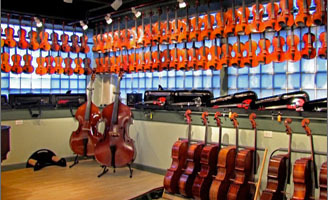 Other cases in the market use a technology where the already finished material is later bent into shape. This causes stress and different thickness in the material, especially at the critical edges, where the thinner material can easily break! 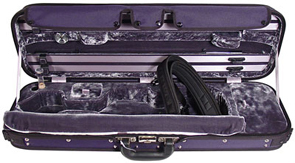 Gewa AIR cases also offer exceptional insulation against both cold and heat. Available in 4/4 only. 3.5 pounds. Suspension interior. 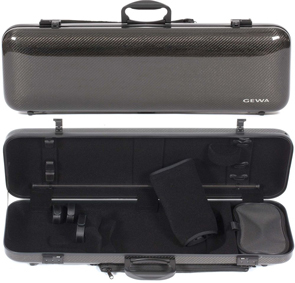 These new German-made cases from Gewa feature a specially developed energy-absorbing thermoplastic shell that is extremely strong, yet lightweight! 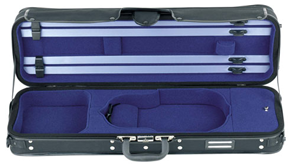 Gewa AIR cases are produced by bonding the material with heat. The foam between the inner and outer shells is injected under high pressure. Other cases in the market use a technology where the already finished material is later bent into shape. This causes stress and different thickness in the material, especially at the critical edges, where the thinner material can easily break! 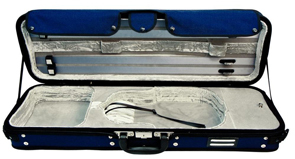 Gewa AIR cases also offer exceptional insulation against both cold and heat. Available in 4/4 only. 4.4 pounds. 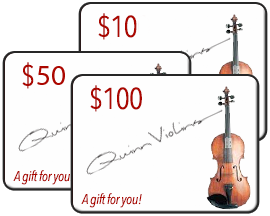 Detachable exterior music pocket. Premium version of the Air Shaped model features greater strength, superior thermal protection, and additional style elements. 4.2 pounds. 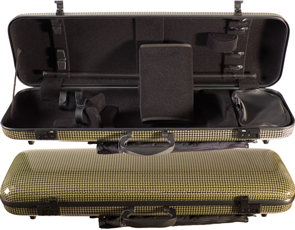 Black velour suspension interior, two bow holders, instument blanket, combination locks, neoprene backpack straps, leather upholstered lid, and detachable music pocket. Premium version of the Air Shaped model features greater strength, superior thermal protection, and additional style elements. 5 pounds. 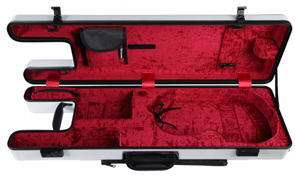 Black velour suspension interior, two bow holders, instument blanket, combination locks, neoprene backpack straps, leather upholstered lid, and detachable music pocket. Same shell concept as other Air cases, but with a 3-D effect on the shell. Suspension interior. 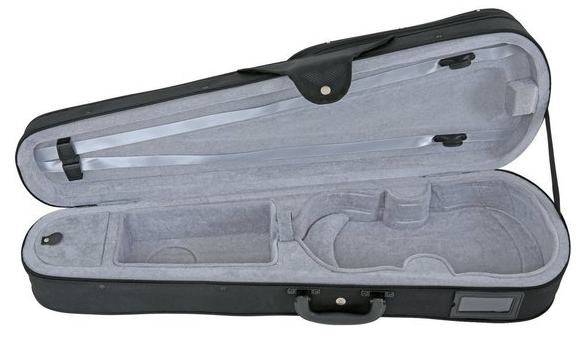 Composite shell, backpack straps, screw attached cover with music pocket. 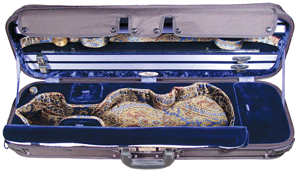 Four bowholders, three accessory pockets in plush velvet interior. 5.7 pounds. 4/4 Only. Suspension interior. Weighs just 4 lbs! 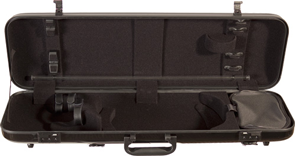 High density polyfoam shell, teflon-coated screw attached cover. Four bowholders, spacious accessory pocket. 4/4 Only. New model with unique design elements. Those who backpack their case requently will appreciate the notch at the top, so the case is worn higher on the back, yet has head space. Smaller overall dimensions. 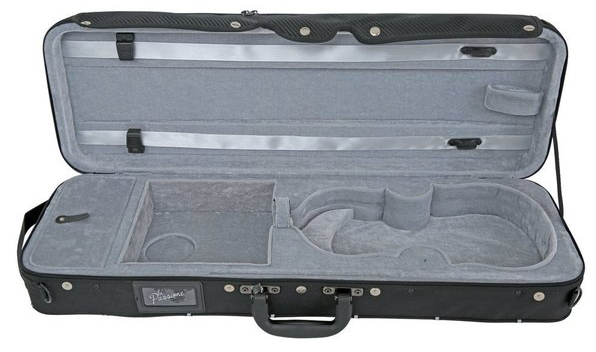 Handle placement for ideal "subway" carrying. 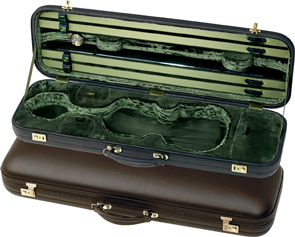 Luxury appointed case with wood shell, suspension system, original Jaeger interior, attached instrument blanket (not shown so that you can see the interior of the case), beautiful plush velvet interior. Integrated humidifier and hygrometer, string tube. 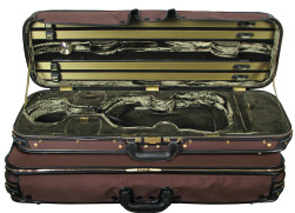 Four Hill-style bowholders and three accessory pockets. Weight 7 lbs. 4/4 only. Styrofoam shell construction. Suspension padding. Backpack straps. Magnetic press buttons. Extremely light weight. 1.7 kg. Black exterior with Gray interior. Styrofoam shell construction. Suspension padding. Backpack straps. Magnetic press buttons. Extremely light weight. 1.2 kg. Black exterior with Gray interior. Shell made from bio-degradable flax. 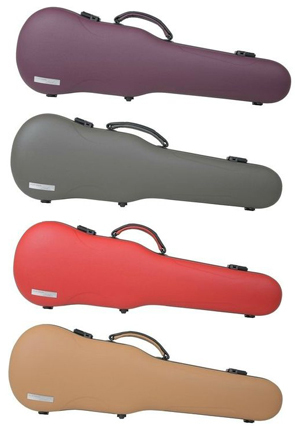 2 bow holders, suspension padding, backpack straps, 1.6 kg (3.6 Pounds) 4/4 only. Shell made from bio-degradable flax. 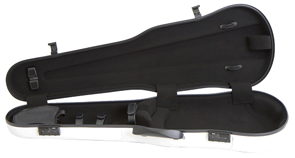 2 bow holders, suspension padding, backpack straps, 2.4 kg (5.25 Pounds) 4/4 only. Model with music pocket also has subway handle.